Highfield House is an elegant and substantial Ashlar-fronted residence thought to date from the mid-1800s and offering a host of period charm and features in keeping with its Grade II listed status including timber sash windows to front and rear elevations, exposed beams and feature stone walls and Cotswold stone fireplaces. The living accommodation is particularly versatile with the sitting and music rooms situated either side of the central staircase, a dining room that opens to the kitchen/breakfast room and a charming drawing room that offers a stone fireplace housing gas-fuelled stove and French doors opening directly onto the paved terrace. The kitchen/breakfast room has terracotta flooring and a range of cream units topped by hardwood work surfaces with a 4-oven AGA fitted with an Intelligent Managment System at its heart. Some previous owners also used the guest bedroom as an additional sitting room to take advantage of the delightful views it affords over the colourful gardens. The principal bedroom has a range of built-in wardrobes and an en suite bathroom whilst there are two further bathrooms, a bedroom and a study also on the first floor with three further bedrooms and a separate cloakroom on the upper floor. Painswick, the “Queen of the Cotswolds”, is a thriving community nestling in a delightful Cotswolds setting. Painswick Churchyard is famous for its impressive array of table tombs and its 99 yew trees about which folklore holds that if a 100th should grow the devil will pull it out. The surrounding towns provide a comprehensive range of social, recreational and retail amenities to suit all tastes including the award-winning Farmers Market in Stroud. Cheltenham is the main regional centre and offers festivals throughout the year embracing topics ranging from racing to literature and music to science. The local playgroup and primary school are within approximately 250m whilst education options in the wider area are particularly strong with independent schools including Kings School, Wycliffe College, Beaudesert Park School, Dean Close, Cheltenham College and Cheltenham Ladies College whilst there are Grammar schools in Stroud, Gloucester and Cheltenham. There are several local shops, galleries, tearooms and restaurants in the village along with a pharmacy, doctors’ surgery, dentists and two public houses. Recreational opportunities in the village include tennis, rugby and bowls clubs with many other groups meeting at the Painswick Centre. 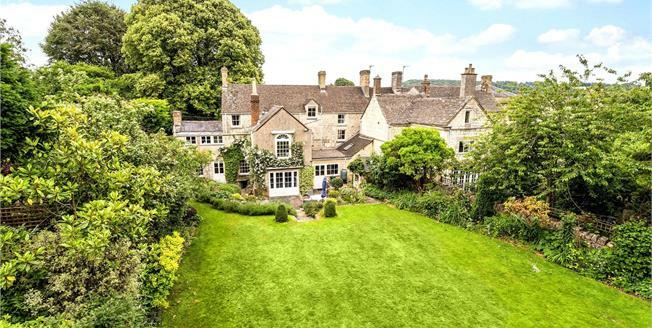 In the wider area, events include racing at Prestbury Park, eventing at Gatcombe, sailing at the Cotswold Water Park and golf at Gloucester and Painswick Golf Clubs. A flagstone paved terrace enclosed by low dry stone walls topped with flowers and shrubs offers the perfect setting for al fresco entertaining against the backdrop of roses climbing over the French doors from the drawing room. Steps rise gently to the level lawns that are surrounded by mature, well-stocked borders and many mature trees including copper beech and magnolia. Double gates open from the roadside to a generous parking area and the detached double garage that has a useful first floor storage area accessed via an internal staircase. A small stone outbuilding offers two useful garden store rooms. Mains gas, electricity, water and drainage. Gas fired heating and hot water.